Ahead of the NHS turning 70 later this year, this week Theresa May announced a big sum cash injection into NHS England to the tune of £20.5bn by 2030. Although it falls slightly short of the 4% increase asked for by NHS England Chief Simon Stevens (the new deal works out as 3.4%), the Government hopes that the extra funding will support a long-term plan for financial sustainability in the NHS. The funding plan in isolation however risks being nothing more than plastering over the cracks without policy interventions to support other areas of health. Adult social care in England has scarcely been out of the news as a sector in crisis this year, and the funders of that system, local authorities, are not looking at any relent in this pressure they have been feeling. At the same time that spending on healthcare in England has been rising from 2011 (albeit at a historically slower rate compared to previous decades) local authorities have had their funding squeezed considerably. English local authorities will continue to see a reduction in funding from central government, with this expected to fall by 54% from 2018/19 and 2019/20. Spending on adult social care in England has fallen by 8% in real terms between 2009/10 and 2016/17, however, these cuts have been higher for local authorities where demand and expenditure was already high. Although councils could receive funding valued at £9.6 billion between 2016 and 2020 to pay for health and social care, this will have to be raised via council tax. Even if councils are able to raise this, there will be a funding gap of £5.8 billion by 2019/20 (increasing to £9.2 billion by 2030/31). But what does this mean for the NHS? Reductions in funding for social care has led to a growing transfer of costs to the NHS. Analysis of Adults Social Care Outcomes Framework (ASCOF) data shows the impact social care shortcomings can have on the NHS. 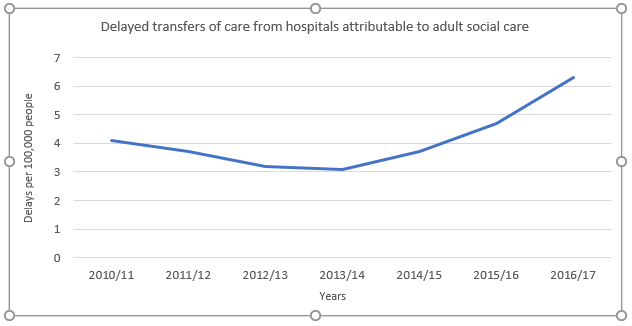 The chart below shows the number of delayed transfers of care in hospitals which are attributable to adult social care between 2010 and 2017. Since 2010 there has been an increase in the number of delays, alongside the aforementioned pressure on the adult social care sector. NHS provider’s audited accounts for 2016/17 say that delayed transfers of care costed the NHS £173 million, up £145 million in 2015/16. Problems in social care do not stay internal but can and do overflow, presenting problems for the NHS. There is a real risk that with the extra funding promised for NHS England, it simply be absorbed into addressing overflow and shortcomings from the social care sector and other healthcare demands. The NHS England funding deal works out as £4-4.5bn a year, however without addressing the issue of delayed transfers of care, this will fall by £173 million to £3.8bn (a 4% dent in the extra cash). Any serious attempt to address the long terms financial sustainability of the NHS must take into account the wider picture of health and its impact on the NHS; without that the next funding crisis will be just around the corner. Dan joined the ILC in May 2018 as a Research Fellow. Prior to joining the ILC Dan was a research consultant at ComRes, specialising in political and social research. Whilst at ComRes Dan was responsible for much of the organisations high profile voting intention research, for clients including the Independent, BBC and The Sun. Dan also worked with social research clients including the Resolution Foundation, NASUWT, the LGA and the Chartered Institute of Building in conducting large scale quantitative, qualitative and mixed methods research projects. Amna joined ILC-UK in April 2017 as a Research and Policy Intern. Her research interests vary and cover class and identity politics, feminism and LGBTQ activism. She is also interested in young people and activism online, as well as looking at regional politics with a particular focus on Yorkshire. She takes an interdisciplinary approach to research and is demonstrated in her analysis.